Clearly they’re confused about what constitutes a quality movie. (Spoiler alert. Gods and Generals doesn’t make it out of the first round.) But I love the idea of a movie bracket. I am so in. 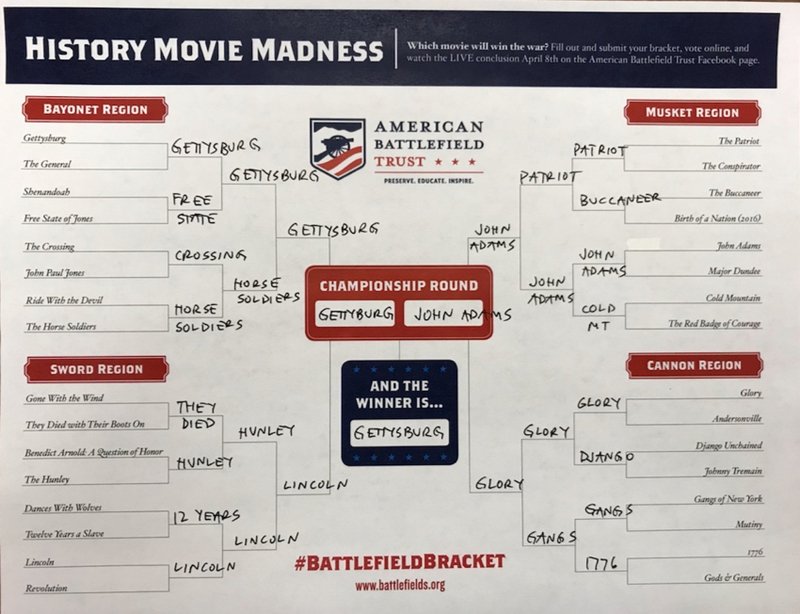 Download the bracket PDF, fill it out, take a picture of it, and submit your History Movie Madness Bracket to bracket@battlefields.org between 9 am, Tuesday, March 19th and 11:59 pm, Tuesday, March 26th. And then from Wednesday, March 27th to Sunday, April 7th, you’ll have the chance to vote for your favorite in a series of Facebook polls on the American Battlefield Trust Facebook Page. On Monday, April 8th, the Trust will convene a panel of mystery historians to debate the Final Four until they emerge with the champion. If you’re genius enough to submit a perfect bracket, you’ll walk away with a copy of Civil War Battlefields: Walking the Trails of History. And bragging rights. Lots and lots of bragging rights. I’ve posted my entry below. Feel free to troll my picks. ← Race to Ratify is latest awesome iCivics game that you should be playing right now.